SHOOTING STAR CABIN 2 is a classic; an elegant, confident home with the look of a 19th Century homestead added on to over decades. 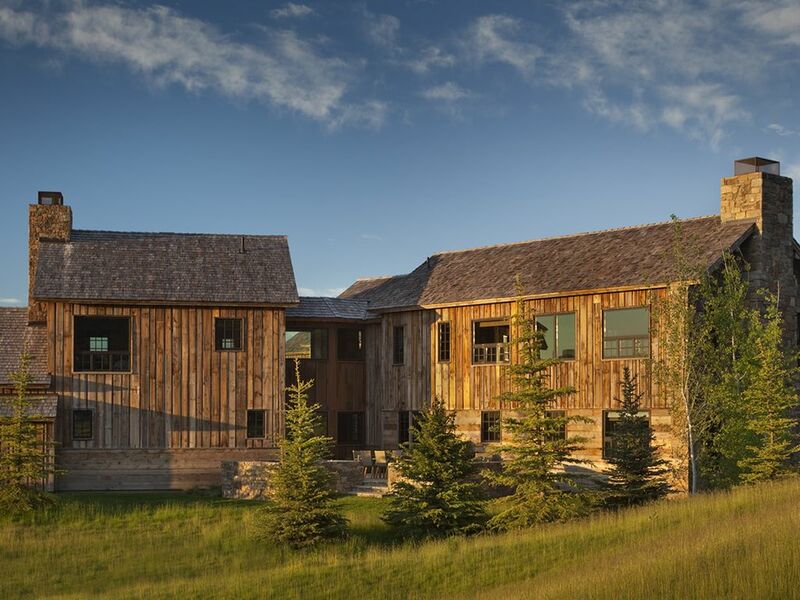 Weathered wood siding, mullioned windows and the circle of towering mountain peaks all around it add to the timeless effect. The house stands on the edge of the rolling golf course, midway between the clubhouse and the village. A log-and-mortar entryway with a heavy, trussed front door opens to the foyer. Inside, layers of detail create richness and structure: old and new, modern and traditional are gathered together in a peaceful, cohesive whole. In the kitchen, a cross-hatch of weathered beams on the ceiling contrast with glossy stone countertops below, a beautiful stainless steel range, under-counter refrigerator drawers, two dishwashers and two sinks. A breakfast bar, lined with clever bar stools – tractor seats mounted on “atomic age” steel legs – divides the kitchen from the living room and dining area. The dining table is a single, awe-inspiring slab of polished maple, and can seat up to eight. The living room has wide-open views to the Tetons, the ski slopes and the unfurling curves of the golf course. Deep sofas and a matching pair of sumptuous leather armchairs face a wood-burning fireplace that is set into a wall of solid stone; another wall holds wide windows that showcase the glorious panorama outside; and between the two, a contemporary sideboard hides a flat screen television, which ascends into view at the touch of a button. Down the hall, more entertainment awaits in a game room above the stairs, along with a globe to pinpoint where you are in the world and where you’re going. Behind the game room, a glass-walled “bridge” leads to the private master bedroom wing. The master bedroom is a sanctuary of calm and comfort. A wide picture window frames a mountain view, and smaller mullioned windows beneath it can be opened to flood the room with mountain air. A stone, gas fireplace faces the king bed; it is a simple, decadent joy to have the warmth of the fire and the coolness of the fresh piney air at once, on a starry Wyoming night. There is a walk-in closet with its own window and view. The room’s master bath is traditional and luxurious, paneled in painted wood, with a soaking tub, double sinks, a private water closet and a separate stone shower. The first floor of Shooting Star 2 holds a two-car garage, and three delightful bedrooms spaced along a bright corridor. The first bedroom is a four-berth bunkroom, wonderfully stylish and comfortable, like the ultimate scout camp – with a buffalo-hide rug upon the floor, military-inspired wire shelving on the walls, and deep drawers for holding clothes or treasures. Many a late-night story will be recounted here. The second guest bedroom is sunny, pretty and serene, with rustic touches like twin beds with barn-door headboards, and a tree cross-section table lamp. A door opens to a private bathroom. The third and final bedroom is a “junior master,” at the end of the guest wing, with windows and breath-taking views on three sides, and a big stone fireplace facing the king bed. The junior master bathroom – with a tub and shower combination, double sinks and a separate water closet – is shared with the bunkroom. Outside, Shooting Star Cabin 2’s private stone dining terrace and big hot tub are screened with a fringe of fir trees and whispering aspens; lush lawns stretch to the golf course. The great high mountains are all around and the ski slopes seem close enough to touch; in the winter, the ski shuttle can take you right to the slopes and bring you back again. Shooting Star stands at the crossroads of all that is wonderful about Jackson Hole – adventure, culture and jaw-dropping natural beauty. All of it, at Shooting Star Cabin 2, on your very doorstep. We loved the cabin at shooting star. The cabin provided comfort and all the amenities. We loved the location being so close to Teton village, the National Park and Jackson. There was so much to do and we loved being surrounded by the Teton mountains! The only thing we wished we could have done was use the tennis courts, clubhouse for dinner and the pool. We understand it was private but it would have been nice because we were on the property. Otherwise it was so amazing and the property managers and maintenance crew for hot tub were so helpful and professional. We would definitely rent again! Beautiful house and location. Clear Creek Group is a wonderful company. Everyone was extremely accommodating and helpful! Our experience could not have been better. The house was absolutely perfect. It exceeded our expectations. The house was terrific for our family of 6 and the Team at Clear Creek went above and beyond on every detail of our stay. Huge Fan of CCG. Place is terrific. Only advice would be to add another couple of large pans to the otherwise well-stocked kitchen. Simply the most perfect home!!! The staff at Clear Creek Group were terrific!!! They all went above and beyond to help us decide on a home to rent and then helping us while we were there. Can't say enough positive things about them. This is a very professional company that we will use again when planning our next trip to this area. The homes in Shooting Star Community are magnificent and every area is beautifully landscaped. Quiet and serene. Our 10 day stay was outstanding and definitely a trip of a lifetime!! !